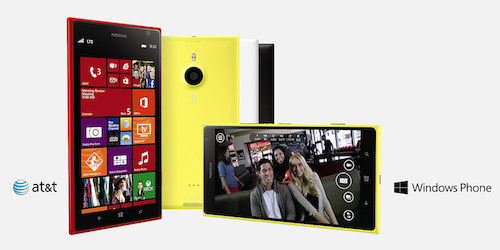 Nokia’s flagship Windows Phone, the Lumia 1520, is their entry into the 6″ phablet club. The 4G LTE enabled device with a 20-megapixel camera, is exclusive to AT&T Wireless, for $199.99 on a two-year contract. This advanced gadget also has impeccable build quality with a fantastic screen. The Nokia Lumia 1520 smartphone is a beast in only the best of ways. Its top tier specs nearly leap over everything out there. A Lumia like this has never been released on a scale this size before, but Nokia nailed it. People want the biggest phone they can get, which is why there are several smartphones from top vendors at 6″ and above. My test phone came in a shiny red color that was made from a single block of plastic, with curved corners. It mostly has a flat back that holds its screen as a slight bump out. Even at this size, the phone feels thin at the same time. 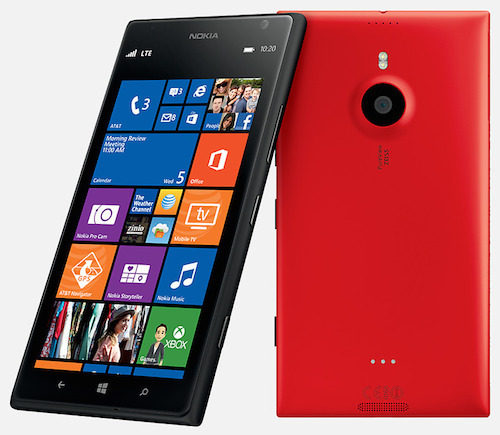 This Lumia measures in at 6.41H x 3.36W x .34D inches and weighs 7.37 ounces. The Nokia 1520 is thinner than the recently released Lumia Icon.A 6″ IPS multitouch full 1080p HD 1920×1080 display tops this phone with a super touch sensitive and tough layer of Gorilla Glass 2. The full HD screen and its impressive 368 pixels per inch passed up the Retina display on an iPhone 5s at 326 ppi. The ClearBlack screen only activates its pixels when color is needed, which produces a nice pop for contrast. Ok, so the Lumia 1520 is huge and has a nice screen, but there’s much more to enjoy. It’s quite fast with the Snapdragon 800 2.2GHz quad-core CPU, 2GB of RAM and 4G LTE.Multiple 4G LTE speed tests were performed in Nevada, California and Utah. It received several results of 8 to 35Mbps+ down and 3 to 11Mbps up. The fastest speeds I received were in Northern California and the slowest were in the Salt Lake City Airport. The results at the airport could be explained by the amount of people using their towers. The Lumia 1520 also offers GPS with A-GLONASS support, Bluetooth 4.0 LE, NFC, dual-band 802.11b, g, n and ac WiFi with channel bonding and wireless charging via an accessory cover that’s available separately. It includes a massive 3,400 mAh battery that kept it going for nearly two days, even after running vigorous tests. Making calls was a little awkward at first because of its size, but a Bluetooth headset helped.Smartphones aimed at business people with only 16GB of storage is somewhat limiting, but it does come with a microSD card slot for expansion. You will want an extra 16GB or 32GB of space to handle all of the photos from its 20MP PureView camera. The rear camera has Zeiss optics with six-elements, optical image stabilization, a 2x lossless zoom, autofocus, dual LED flash and a backside-illuminated image sensor. For how big the screen is, I was able to take photos and video with one hand while steering a horse with the other. The buttons that run along the right side control volume, power and camera functionality. The camera shutter button has two levels, one to focus and another to take a picture. Finally, this Windows Lumia Phone has an easy way to wake it up by double tapping on the screen. Slide the image up to unlock and it’s ready to go. Nokia has made a big splash in the smartphone market with its biggest phone ever. It shows that their engineers know consumers want a large tablet like phone. 20MP cameras that produce crisp photos were only a dream a few years ago and now it’s a reality. The Nokia Lumia 1520 is currently available at $199 with a two-year contract on AT&T Wireless. Though, you might be able to find it less at a Microsoft Store. My extended test of the Lumia 1520 went very well. I used social networking apps, several photo apps like Instagram and Vine. A firmware update fixed a few issues I had with it early on in testing. Live tiles on the home screen are growing on me and really do make accessing apps easier. It’s 6″ screen, high quality construction, fast wireless and 20MP camera make this an impressive phablet. A tablet like 6″ screen. Quad-core CPU and fast 802.11ac WiFi. Free OneDrive Microsoft cloud storage. Free AT&T LOCKER cloud storage. Somewhat hard to hold in one hand. Slow auto focus but the camera does offer optical image stabilization. 16GB is a small amount of memory in a business-orientated smartphone. Disclosure: I received a Nokia Lumia 1520 at no cost for review. I did not receive compensation for this review. Photos are courtesy of Nokia. All thoughts and opinions are my own.